Located at the corner of Bent and O'Connell Streets at the top of the broad curving steps of 1 Bligh's entrance is a new public artwork titled 'Day In, Day Out', created by distinguished Australian artist James Angus. 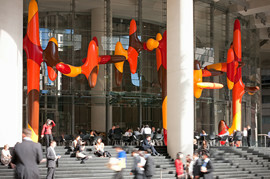 James Angus was chosen from an international field of seven of the world's leading artists by a judging panel which comprised the 1 Bligh Street co-owners and architects. The proposal was also reviewed by the City of Sydney Public Art Advisory Panel. The sculpture is a complex network of three-dimensional ellipsoidal surfaces drawn from shapes expressed in the design of the building. The form is enhanced by a brightly painted colour scheme which traces the underlying geometry. From inside the building, the sculpture gently frames views of the city and plays to the building's natural strengths by drawing its meaning from the same sources: sunlight, shadows and a modern approach to placing art and architecture in an urban landscape. The sculpture is designed to engage the public as a Sydney landmark and enliven the Farrar Place precinct. The artwork was featured on ABC's Art Nation program on 22 July, 2011. To view the clip from Art Nation, click on the video below.